Home > About the Gurkhas > Who are they? To this day, they remain renowned for their loyalty, professionalism and bravery. Where do the Gurkhas come from? They first encountered the British in 1814, when the British East India Company fought against them during the Anglo-Nepalese War. British forces admired the Gurkhas’ military abilities and honourable tactics, and first recruited Gurkha troops in 1815. The Peace Treaty that ended the war in 1816 enabled the British to officially recruit Nepali Gurkhas – and so began Britain’s relationship with Nepal, our ‘oldest ally’ in Asia. Since then the Gurkhas have served with distinction throughout the world, earning an incredible 13 Victoria Crosses for acts of extreme valour, along with countless other medals. 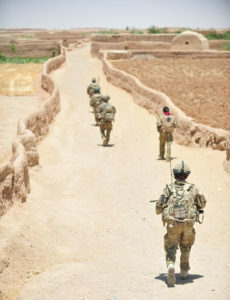 Gurkha soliders on patrol in Afghanistan. 1. The Gurkhas have served with loyalty and distinction for over 200 years. Their bicentenary in 2015 was celebrated by HM The Queen, Prince Harry and many others around the world. 2. British officials in the 19th century declared the Gurkhas a Martial Race, a term describing people thought to be “naturally warlike and aggressive in battle”. 3. Rifleman Kulbir Thapa VC, the first Nepali recipient of the Victoria Cross, had never even been under fire until the battle where he heroically earned his medal. 5. The Gurkha selection process has been described as one of the toughest in the world. It culminates in the gruelling doko race, which involves carrying 25kg of sand while running up a steep 4.2km course. 6. Measuring less than five foot, hero Gurkha Rifleman Lachhiman Gurung VC would fail today’s army selection criteria. 7. Soldiers in today’s Brigade of Gurkhas each donate one day’s pay every year to support their forebears – the older veterans in Nepal. Over 60% comes to the Trust. 8. During the World Wars, stealthy Gurkha soldiers would sneak up on dugouts in the dead of night and feel unsuspecting inhabitants’ boots to find out if they were friend or foe – Axis and Allies had different ways of tying their laces. 9. In 2015, a devastating earthquake struck Nepal, destroying the homes of many ex-Gurkhas. The Queen’s Gurkha Engineers deployed to help with rebuilding efforts in an exercise known as Op MARMAT (‘rebuild’ in Nepali). 10. Captain Rambahadur Limbu VC is the last surviving Gurkha VC holder, having earned his medal in Borneo in 1965. His citation claims that his actions that day “reached a zenith of determined, premeditated valour which must count amongst the most notable on record”. The museum, located in Winchester, boasts an impressive collection with rich displays on Gurkha history. Read the history of the famous Gurkhas in our interactive timeline. News and updates from the serving Brigade from around the world.